Knauf is a manufacturer of glass mineral fiber insulation products for residential and commercial buildings. 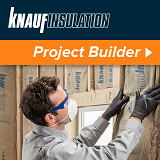 With a clearly established leadership position in sustainable development in the building materials industry, one word best defines Knauf Insulation: transformative. Explore our products and feel free to contact us or call 317.421.8727 for more information. Greenguard® certify its products for indoor air quality (IAQ). In 2008 Knauf began production using a new bio-based binder adhesive that was possibly the largest green chemistry initiative in the world. Our Ecose®Technology replaced the phenol-formaldehyde resin used traditionally in glass fiber insulation products. Today, the entire glass mineral fiber industry has followed Knauf’s bio-based lead. UL Environment validates all of Knauf products as formaldehyde-free. Issue an EPD for pipe insulation. Recognizing that the mechanical room is commonly overlooked in a low VOC building strategy, Knauf brought light to the fact that the mechanical room should not be ignored given low-emitting and formaldehyde free options are available. Declare and the Living Building Challenge. Since 2012 Knauf Insulation North America has used the Living Building Challenge Redlist as our developmental benchmark. The Redlist is a list of chemicals that are avoided in material imperative for the construction of LBC buildings. Formaldehyde is just one of about 800 chemicals on the Redlist. Today, no other insulation company comes close to the sustainable development achieved by Knauf in this regard. Thank you for considering Knauf Insulation products and for allowing us to help you with what we believe to be the best engineered and sustainably developed building materials available in the world today.